As the winter season comes to an end, many ski enthusiasts are still left craving for more opportunities to go down sliding through the white powdery expanses. If you are one among them who simply do not get enough of skiing in those few months of winter, Zermatt is the perfect place for you. 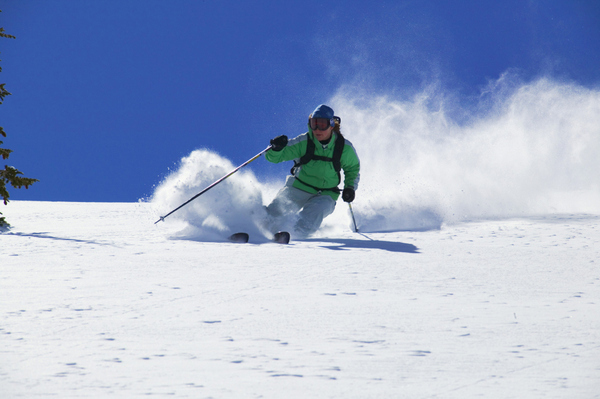 Zermatt offers ski pistes where skiers can enjoy all year round and has the largest and highest piste of all. Zermatt with its enormous mountains touching high altitudes and the gorgeous Theodul glacier tucked just beneath Matterhorn endows ski buffs with the opportunity to go on a ski spree all throughout the year. Ski aficionados of all levels of mastery and even those who wish to experience its thrill for the first time can get their poles to dive down along the smooth nursery slopes and challenge the pistes running twenty-five kilometers while treating their eyes with some stunning views of the snowy Swiss swathes. The 360 kilometers of pistes and the highest ski lifts that go up to the Klein Matterhorn at 3,883 meters, allow skiers to enjoy the magnificent view of the Matterhorn while enjoying the snow. The glacier skiing area offers obstacle free snow suitable for beginners and intermediates, where there are one or two steeper areas, black and difficult area such as moguls for experienced and challenged skiers. Zermatt not only has ski pistes available for summer skiers but also for summer snow boarders. The Gravity Park on the Thodul Glacier has 200 meters of Super pipe, half pipe, kickers and rails as the entire winter skate park for everyone to enjoy. During summer, the lift from the village starts as early as 7 A.M and the mid-summer snow conditions are usually icy first thing in the morning but by mid-morning, the conditions become soft like perfect spring snow. Later in the day, the snows may become wet and heavy therefore pistes closes before 2 P.M, in mid-summer so if skiers wants to enjoy a nice long fun on the piste, an early rise is key. Summer skiing at Zermatt not only offers an amazing time on the piste but also breath taking view. Skiers can see over Switzerland and Northern Italy and even in the distant Mt. Blanc and France during a clear day. To see one of the finest panoramas in the world, take the little “Gipfel lift” to the summit of the Klein Matterhorn where it offers the amazing views of the mountains and enjoy summer skiing like nowhere. To get to Klein Matterhorn, skiers will need to drive or take the public transportation from Brig to Tasch and then take the train to Zermatt. From there take the mountain train to the Klein Matterhorn.